A4 Size 6.8 x 10.7 in. (173 x 272 mm) 8.3 x 11.7 in. A3+ Size 11.5 x 17.8 in. (292 x 452 mm) 13 x 19 in. 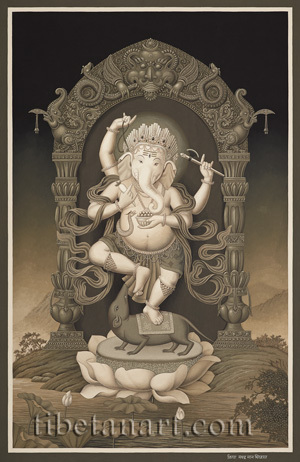 In this sepia painting four-armed Ganesh (Ganapati) is shown dancing in tandavi or bow-and-arrow posture, with his right leg drawn up and his left foot resting upon the saddle-cloth of his vehicle, a long-nosed Asian shrew or chuchundra. The shrew gazes upward at Ganesh, with its four feet resting upon the seed-head of a lotus that arises from a lake. Ganesh's stout and pot-bellied white body is adorned with a floral-patterned loincloth with a pleated apron, a long billowing silk scarf, and a pleated turban-like headdress. He wears golden ornaments, a five-jeweled crown, and a serpent circles his chest and stomach as a sacred thread. Around each of his shins he wears little spherical 'dancing bells' (Skt. ghungharu), which are used in classical Indian dance and in the Newar charya-nritya sacred dance traditions. Traditionally up to seventy-five bells are used for each leg, and these bells are sewn onto crescent-shaped sections of felt, which are then bound around the shins or ankles with ribbons. Ganesh has three piercing eyes, his forehead is marked with the three horizontal vermilion lines of a Shaivite tripundra, and the tip of his right tusk is broken off. With his first pair of right and left hands he holds a white radish (mulaka) - his favourite vegetable, and a bowlful of yellow laddus - his favourite Indian sweets. With his second pair of right and left hands he holds aloft a rosary of rudraksha beads, and an axe. The lower landscape of this painting shows buds and leaves arising from the lotus-lake, with bushes, rocks and hills behind. Ganesh is enshrined within an architectural arch or torana, the lotus-ornamented and eight-sided pillars of which ascend from the apertures of two longevity vases. Upon the ornate upper arch of this torana stand two makara or 'water-monsters', with long scrolling tails and blade-like tongues that support little bells. And crowning the top of Ganesh's torana is the fierce horned and serpent-devouring head of Cheppu or kirtimukha, the 'face of glory'.